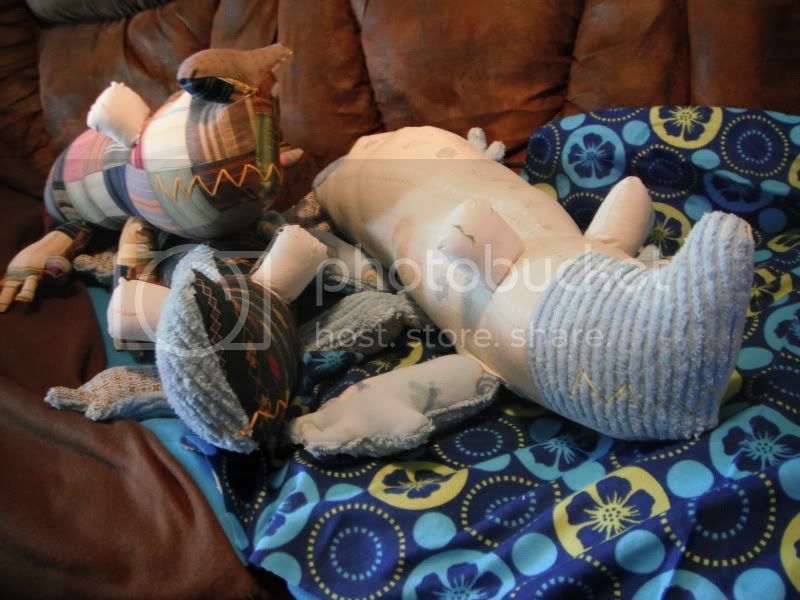 Here's the story behind these 3 crocodiles. I was shopping at JoAnne's Fabric Store one day. I was by myself, and minding my own business, looking at the fabric. I found some on sale and went to the cutting board. The lady behind me in line had a baby boy in the cart. She commented on how cute the fabric was. I said, "Thank you, I'm going to make a crocodile out of it." She said, "Oh wow, my boys would love to have one." She proceeded to tell me she also had 3yr old twin boys (they were not w/her). She also told me she was trying to teach herself how to make stuffed animals. So I said, "I'll make each of your boys a crocodile, just give me your phone number and I'll call you when I'm finished w/them." Her mouth fell open and she said, "Really?" I said, "Really." I didn't know this lady from Adam. She gave me her phone number, and I finished the crocodiles a few weeks later. When I called her to tell her the crocodiles were finished, I was a little bit surprised, shocked, and taken aback by what she said. She said, "Yes, I remember you. I didn't think you were really going to make them. I mean who actually does something like that now and days?" "And, you don't even know me." We met back at JoAnne's the other day, and I gave her the crocodiles. She was so excited and tried to pay me. I told her, "No, I don't want anything for them. They were a labor of love, and a joy to make. I got to try out some new ideas." She also requested my phone number, in case she needed some advice on making stuffed animals. I hope the boys will love their new friends on Christmas morning, as I was told that is when they will be receiving them. Santa will be bringing them. Enjoy! this just shows how taking a lil time to talk to people can lead to 3 really cute crocodiles and a neat story! Thank you cat! Talking to complete strangers is very difficult for me. I'm a very keep to myself kind of person. I spend most of my day, every day by myself. When I worked as a phone reservation agent for Hertz car rental, was the most terrifying job of my life. But, I like helping, especially kids. They tug at my heart. I live by these 3 mottoes: Give more than you take, Be kinder than you have to be, every one is fighting some battle, and Be the little horse w/the bell (a story my sister sent me). What a gorgeous story, and fantastic crocodiles! gotgrey, what a lovely story! It was so kind and generous of you to do this for her. I bet you made her holiday season and I suspect she'll be paying your kindness forward. That is completely awesome. Great story, & the crocs are super cute. I vote for these because of the spirit of the giving...love the story. We wish you a Harry Christmas, and a Happy New Year!